I have a credit card from Barclay and they just added free FICO score to my account. 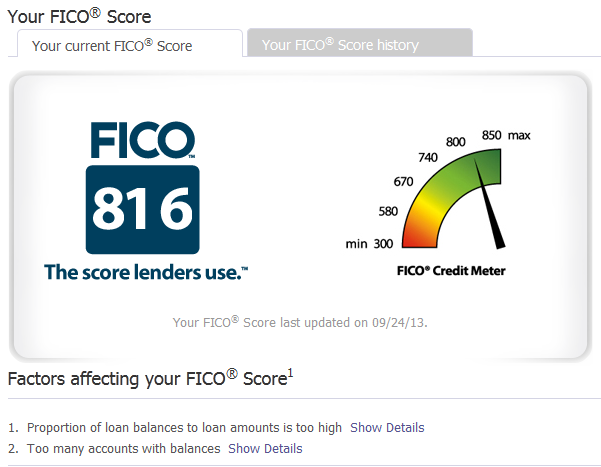 I'm pleasantly surprised to find that my FICO is 816. Its nice to have a score above 800. That will help to get me the best rates on any loans. You might notice that the image above has two notes at the bottom with factors affecting my score. Those are the negatives in my history that keep my score from being higher. Sometimes I've seen such comments and worried about them as if I'm doing something wrong. But given that my score is now over 800 and I"m still getting comments like that I'm not worried. Maybe they just have to give some reason why the score isn't perfect or what areas there are for you to improve on. I've had and used credit for about 25 years. My mother got me a store credit card when I was in high school in order to get me a head start on building credit. I then got a pile of credit cards which I proceeded to abuse in college. I haven't been late on a bill payment for... um... about 18-20 years maybe? I'm honestly not sure when I was last failed to pay a bill on time. I pay my credit cards off every month. I haven't had a car loan for about 15 years. The only outstanding debt I have are mortgages. I haven't applied for any new credit for over a year.